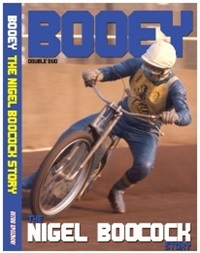 Booey is simply the story of Nigel Boocock's life in speedway, straight from the horse's mouth. Nigel is interviewed extensively at his home in Australia and recounts tales from his incredible career that ran from the fifties through to the eighties. With so many events to cover it's no surprise that his story spans two DVDs, running to a total length of around 2.5 hours. Nigel is interviewed by former rider Steve Magro, a man who has clearly done his research as he's able to prompt Booey to talk about incidents and events of which he'd probably almost forgotten. This ensures the interview is comprehensive and answers any question that Booey's fans could ever have dreamed up. The interview is interspersed with film clips from Booey's career - from his World Final appearances, his tours with the British Lions and from his testimonial meeting. There's also footage from the 1966 World Team Cup final, complete with Polish commentary. Given its age, it's not surprising that some of this footage is grainy, but it's still well worth seeing. The DVD also features hundreds of pictures from Booey's career at home and abroad, along with many photos of those riders he discusses throughout his interview. In this 21st century production there's also room for some cutting-edge technology from an earlier era - Wally Loak's famous tape recordings. We hear Wally interviewing Nigel's parents as they recall an early injury to their son, we also hear commentary of Nigel in action in his pomp and of the enthusiastic support he received from his loyal fans. Something from a different era entirely, but a most worthwhile inclusion in this retrospective. Booey made his name as a Coventry rider, moving from Birmingham after promoter Les Marshall pulled out when Eric Boothroyd was banned from racing. That was a lucky break for the Bees as Nigel went on to score almost 8,000 points in their colours. He would have been happy to have stayed even longer but admits that eventually terms couldn't be agreed since "all the money had been given to Ole Olsen". He went on to appear for Bristol, Exeter and Canterbury before finally hanging up the famous blue leathers for the last time. Despite appearing in eight World Finals, he never truly cemented his place amongst the sport's very best. He attributes this to his never-changing attitude to racing - he treated a second half race at Canterbury in the same way as a World Final race at Wembley. In fact he doesn't seem to even have particularly strong recollections of his World Final appearances, whereas one suspects Ivan Mauger could probably recall every corner from all of his World Final races. Perhaps therein lies the fundamental difference between the good and the great? The DVD also features a moving tribute to Nigel's late son Darren who was tragically killed in a road accident. There's an interview from 1995 with Darren, courtesy of the incomparable Wally Loak, in which Darren reflects on his own racing career. He's honest about his shortcomings and the fear of injury that curtailed his career. Darren's son Jack and Nigel's wife Cynthia also make brief cameos, making this a DVD the Boocock family themselves will treasure. Clearly this product has been assembled from a variety of different sources, meaning that video quality is variable, though the picture and sound on the interviews with Nigel are always good. Don't go expecting blu-ray quality, just sit back and enjoy the interesting, comprehensive and informative content. "Very saddened to learn of the death of a true gentleman and outstanding rider, Nigel Boocock. Deepest sympathies to his wife Cynthia and all the family. Nigel was one of my boyhood heroes, a spectacular gutsy rider who always gave of his best. A magnificent example to all, who put his club Coventry first, above himself. Rest in peace Booey and thanks for the memories." "Nigel's funeral was a Who's Who of speedway, they came from far and wide to pay their respect of a much love legend who touched so many lives. Riders, fans, mechanics and writers stood shoulder to shoulder emotions ran high. The sons of legends, Mark Warren, test stars, Jim Airey,John Titman, Jason Crump, Bill Bryden, Bluey Scott, Steve Regeling,Kev Toropie were just a few of the riders, speedway folk young and old all had a Booey story to tell. Rae Mauger, Trevor Harding and Bert Kingston move gave moving eulogies, there was not a dry eye in the place "